Author James Patterson helps connect children with books that will turn them into lifelong readers. The book reviews are arranged in four groups by age level, with links available on the main page. Other areas of the site are linked in the navigation bar at the top of the page. If youre interested in getting your children or students to read more, provide them with some of the books recommended and reviewed on the ReadKiddoRead Web site. 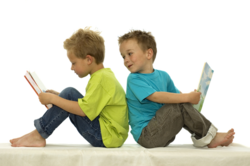 The books arranged according to age: picture books for 0-8, transitional books for age 6 and older, great page turners for ages 8 and above, and great advanced books for ages 10 and above. There are over 170 reviews on only the books that kids are sure to gobble up! Click the Community link at the top of the page to find lesson plans for a host of books that are used in the classroom -- such as James and the Giant Peach, Harry Potter, Charlottes Web, Clementine, and more. This is one site that teachers will want to be sure to visit before they make up their summer reading lists for students.